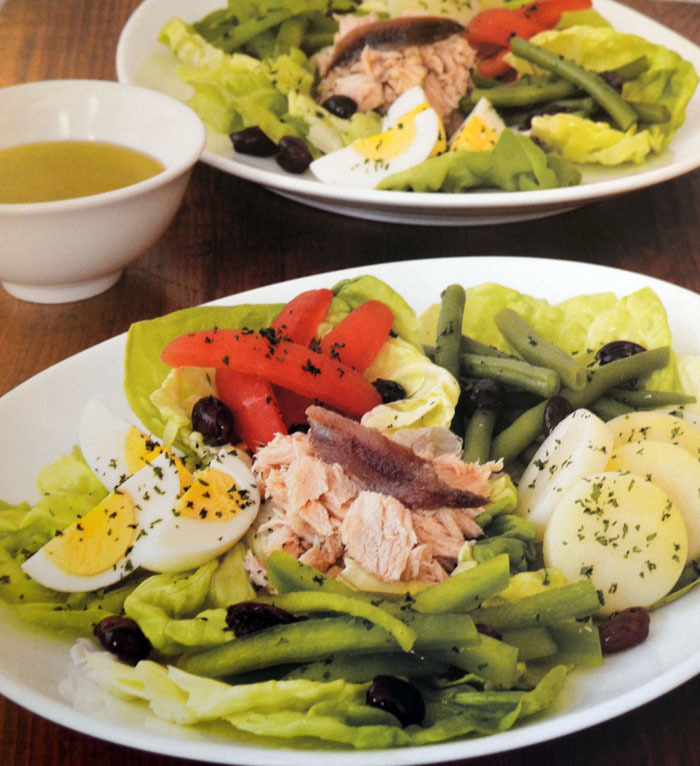 For this week's Meal Prep Monday, take advantage of the warm summer weather while you still can with a light and refreshing Niçoise Salad. From "The Fundamental Techniques of Classic Cuisine"
1. Make the vinaigrette by combining the vinegar, garlic, and salt and pepper to taste in a small bowl. Whisk vigorously. Let stand for about 2 minutes, then gently whisk in the oil. Taste, and if necessary, adjust the seasoning. 2. Scrub the potatoes under cold running water to remove any dirt. Place the potatoes in a medium saucepan, cover with cold water, and place over high heat. Bring to a boil. Lower the heat and simmer for 20 minutes or until the potatoes are tender when pierced with the point of a small knife. remove from heat and drain well. Set aside for about 10 minutes to cool slightly. 3. While still warm, peel the potatoes. Slice the warm potatoes, crosswise, into 1/8 inch-thick slices. Place the warm potato slices in a small bowl and add enough vinaigrette to just lightly coat. Toss to combine. 4. Cut the tomatoes into 4 to 6 wedges each and remove the seeds. Place the tomatoes in a colander and salt lightly. Place the colander over a bowl and allow the tomatoes to drain for about 5 minutes to remove excess liquid. 5. Cut the green pepper in half lengthwise and remove the core, membrane and seeds. Cut the pepper into 2-inch strips. Set aside. 6. Place the lettuce in a large bowl, add enough vinaigrette to coat, and toss to combine. Line a platter or salad bowl with the seasoned lettuce. 7. Place the tomatoes, hericots verts, and peppers in separate small bowls. Add just enough vinaigrette to each bowl to lightly coat the vegetables. Toss to combine. 8. Place the tuna in the center of the seasoned lettuce on the platter. Arrange the potatoes, tomatoes, hericots verts, peppers and hard-boiled eggs around the tuna. Criss-cross the anchovy fillets on top of the tuna. Sprinkle the salad with the chopped herbs and place olives around the edge. Serve immediately. Learn what its like to love what you do (#lwyd)! Study Classic Culinary Arts in New York or California.